Dr. Borgardt's famous - Porterhouse Steak Recipe. Yes, it is finally spring here in Kalispell, Montana. I would like everyone who has a BBQ or a cast iron skillet to join me in cooking the best cut of meat, ever, the porterhouse steak. So lets get to it! 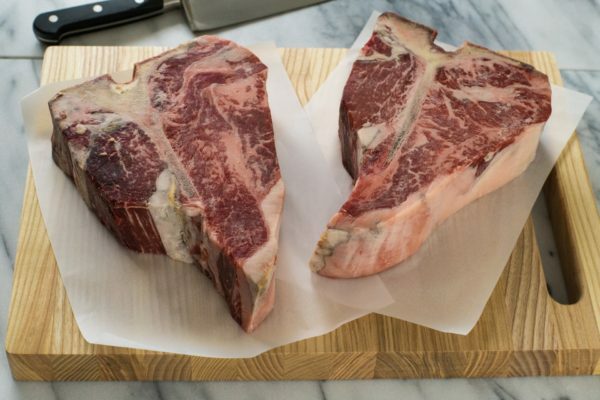 Take the steak out on your counter, set on a rack and liberally coat it with all the salt you see. Yes, as Ron Swanson said "All". Let it set out for at least one hour. Unless you have flies or bugs hanging out in your house don't worry there is enough salt and not enough time for anything to start inoculating the meat causing any issues. If you do just put a bowl on top of it and give it an extra hour to come to room temperature. 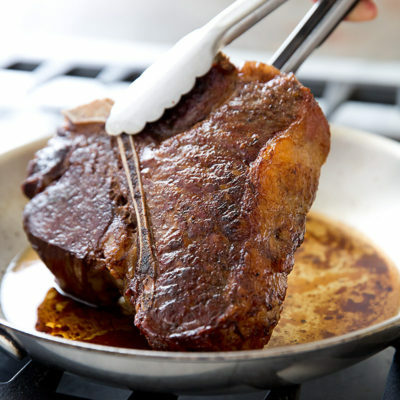 The preparation goal is to do two things get the meat to room temp and to allow the salt to pull out proteins that when seared create a crust. Start BBQ 20 min before cooking whether its a coal or a gas we are looking for degrees if possible of more than 800F. If you are using gas, that means turning your gas on full. If you have neither then get the oven started to 475F and start a cast iron skillet 10 min on full flame to imitate the act of heat from the BBQ. The goal here is to create a surface that will sear those proteins drawn out of the meat by the salt at room temperature. Sear both sides of the porterhouse steak over the hottest portion of the grill, covering the top for 90 seconds a side, no more, no less. In between the one flip that will occur - DO NOT TOUCH IT. If your using coals, set them an area that is concentrated allowing an intensification of the heat. This also allows you to reserve the other area of your bbq to act as an oven. The same concept is applicable for the gas, just turn off gas lines on the side where the steak is and turn down the one burner to medium / low to resemble an oven. Using a cast iron skillet make sure that you have that thing almost smoking hot it will again take 10 min. When it is done on the second side place in the oven. Now here is where the argument happens. I like my steaks bloody rare. I take them off the grill at this point setting them on a butchers block and let rest for 10 min. Generally additional cooking times are going to vary for their doneness. However, if you go by this guideline of letting them rest in their respective oven types they are all equal. 15 minutes of time in their respective oven type = Medium (if you do this please don't show me a photo or talk about it to anyone you should be ashamed of yourself). Set on a wooden butchers block for 10 min. Do not use plastic. Plates and cookie sheets are acceptable. I know you have heard this before; DO NOT TOUCH IT FOR THE NEXT 10 MIN. This is a resting period. If you cut through the meat prematurely, it will be like other things that are labeled with the same adjective; Null and void.